Adding concrete acid stains, dyes and sealers to your unattractive and drab driveway will transform the surface into a protected colorful concrete finish. Once the concrete driveway, parking deck, or parking lot is thoroughly cleaned with pressure washing, and all of the concrete cracks and repairs are filled. Concrete coloring agents are sprayed into the concrete driveway with multiple colors to create a faux stained effect. Different colors will darken and create natural variations in the concrete driveway and blend the concrete surface together. Concrete staining on driveways or pool deck areas will cover and camouflage natural surface imperfections while giving the surface an artistic appearance. In addition to giving the concrete color, other accents such as decorative saw-cuts will resemble the look of tiles or borders. Concrete sealers may also be colored to make the driveway resemble new gray concrete, while also increasing the overall strength of the concrete. 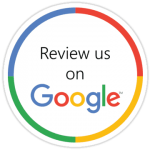 This application is perfect for home renovation projects because this process is cost-effective and requires minimal downtime for homeowners, homebuilders, or general contractors. In the Atlanta decorative market, concrete staining with vibrant and exotic colors can change the feel and overall appearance of its surroundings, making it ideal for any residential concrete surface. 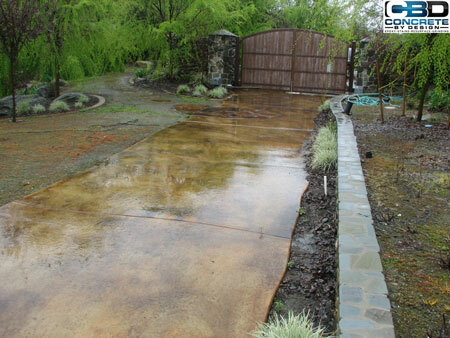 We offer decorative driveway and patio concrete contractor services in the South Atlanta region. Existing old stamped or stained concrete can also be restored using a series of products to make it look new again. If you’re stamped concrete needs to be re-sealed or re-colored, and the concrete surface is still in good condition, then applying another color and sealer will keep it protected and prevent color fading in the future. This process will give an even appearance by using concrete dyes, stains, or tinted concrete sealers. After the surface is thoroughly inspected, we will determine the best concrete sealers and coloring additives to restore the surface. Exterior stamped concrete can fade over time due to U.V. light, heavy foot traffic, vehicle traffic, and most of all natural weather conditions like rain. By adding additional color to the concrete surface over the existing stamped or stained surface, the concrete color can be matched or completely changed to a new color if needed. Our concrete dyes and stains are resistant to U.V. light and will not fade over time, although stamped and stain concrete sealer must be reapplied every few years to maintain gloss and clarity levels. Our stamped concrete sealer is a pure acrylic concrete cure and seal that protects and enhances the appearance of existing concrete with a clear, non-yellowing seal that is harder and more durable than Big Box Store cure and seal products. Our sealers for decorative concrete restoration are formulated to enhance the color of stamped concrete, exposed aggregate, and colored concrete pavers, which gives the surface a deeper and richer appearance. Sealing stamped concrete provides a layer of protection against the damaging effects of traffic while also allowing the concrete sealed surface to “breathe”.